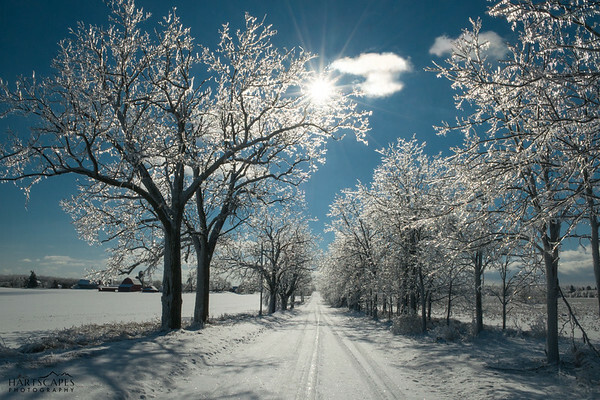 Icing on the light! 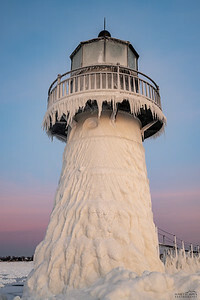 It looked as if this lighthouse was covered in cake frosting, the way it was caked on. 🤣 I know, I know, cheesy but it is true! 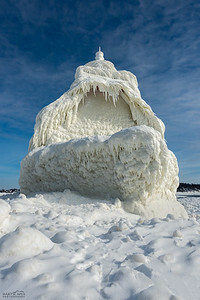 I just thought it was so cool to see the Grand Haven Lighthouse (in Grand Haven, Michigan) covered in this beautiful ice. 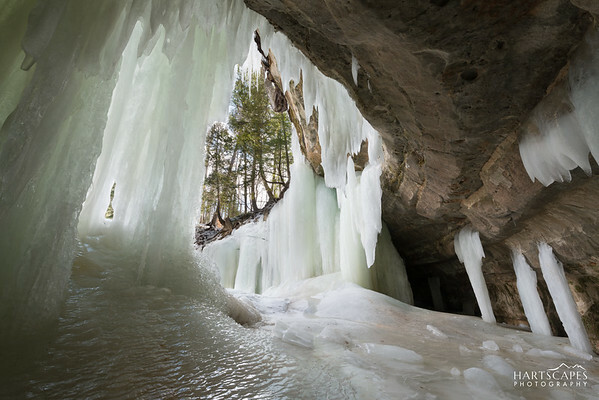 As Winter slips away to early spring, the Ice Caves in Eben Junction, Michigan start to melt behind the shear walls of ice. I absolutely loved the colors of the sunset glow at the St. Joseph Lighthouse in St. Joseph, Michigan all dressed up in its beautiful icy coat. Cripple Creek is a small town located west of Colorado Springs, Colorado that was known for gold mining. This is the view from above the town in November of 2013. 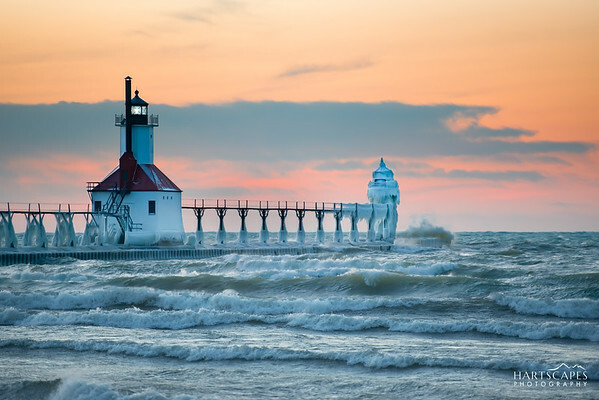 A beautiful sunset at the St. Joseph lighthouse in St. Joseph, Michigan on a very windy day. This beautiful falls is Munising Falls in Munising, Michigan in March of 2017. 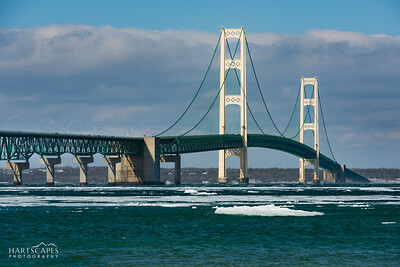 Michigan's Mackinac Bridge, sometimes called the Mighty Mac, in March of 2017 during a partial bridge closure. 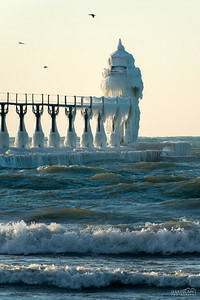 Ice cold day at St. Joseph Lighthouse in St. Joseph, Michigan. Winter sunset near Sand Point in Munising, Michigan in March of 2017. 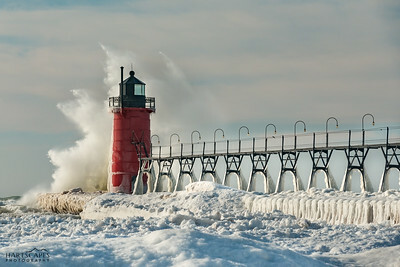 Lake Michigan was showing her fury along the west coast of Michigan in South Haven. The slamming of the waves dwarfed the 35 foot tall lighthouse. 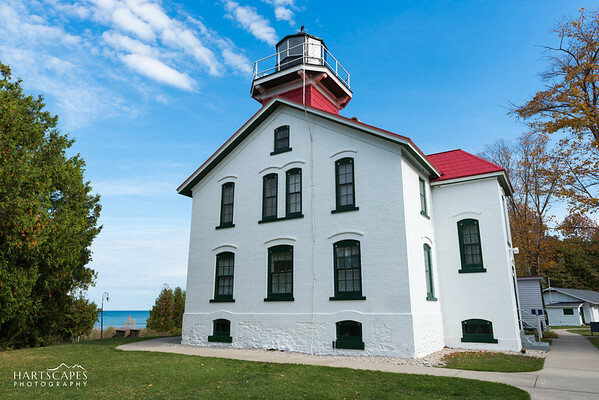 Grand Traverse Lighthouse on a beautiful fall day. Lovely winter sunset in Williamston, Michigan. 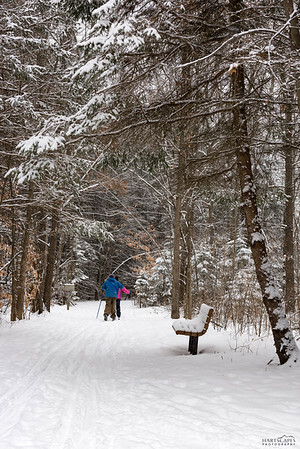 Two people cross country skiing at the Harris Nature Center in Okemos, Michigan. 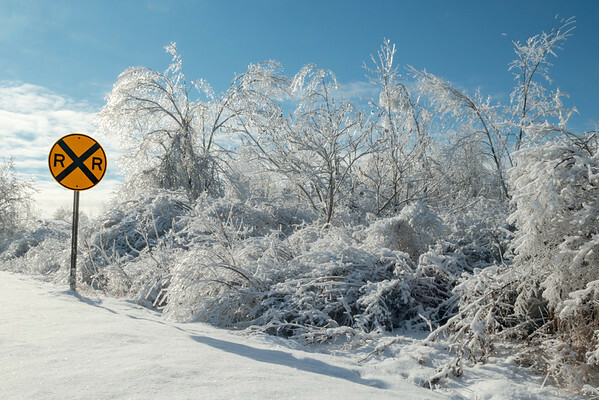 Early and late season snow storms are my favorite because the storms usually bring very wet snow which allows the snow to stick to everything. 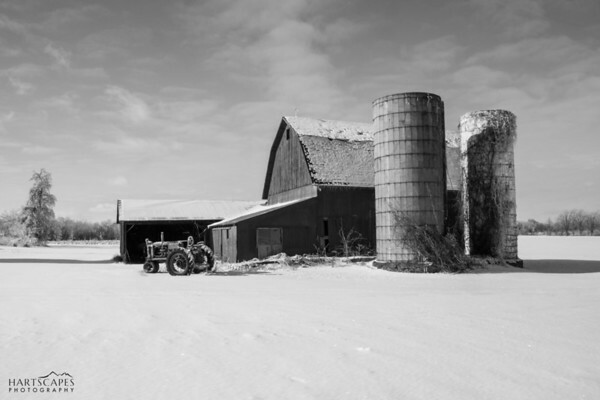 Since we just got about six inches of wet snow yesterday, I figured I would slowly slide away from my beloved season; fall and start showing the beauty of Winter. This beautiful waterfall is found via a road side park just outside of Munising, Michigan. 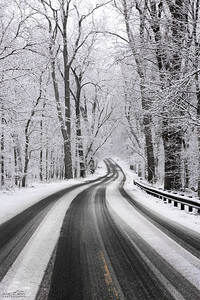 It is a short walk that is doable for almost all age groups. 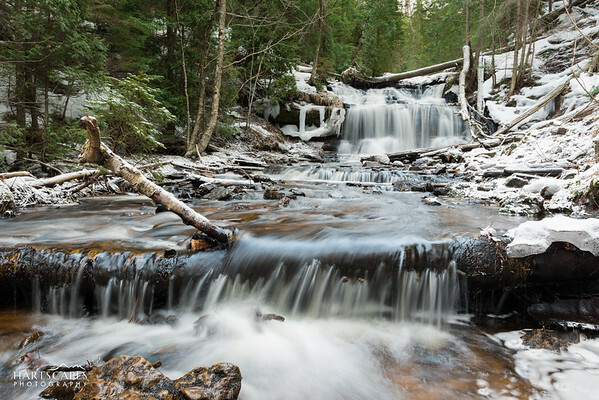 I was lucky enough to visit Wagner Falls during a small snow squall just after a hard winter thaw. 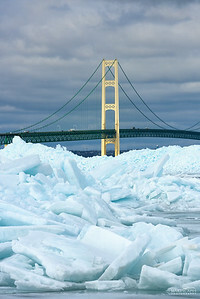 As many of you know I like to photograph the Mackinac Bridge and after I heard about the blue ice at the bridge I was curious. Was it really that blue? Was it as big as everyone was saying it was. How big of a deal was it really? Well the curiosity got to me and I had to check it out. I will have to say YES the ice is that blue and WOW it is something you must see in person. While looking at massive ice chunks that in some places were 24 inches thick you can't help but think how much force it would have taken to move this much ice. While I answered a lot of my questions while there. Yes, it's that blue, yes it is massive, and yes it’s a big deal (as it doesn’t happen too often). I actually left with more questions. How long did it take to pile up, was it overnight or over a few days? What did it sound like? It had to have been so loud. How long will it stay? 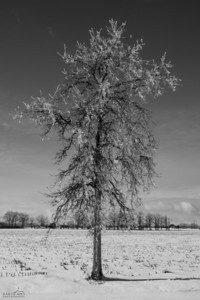 Will the ice come up any further? 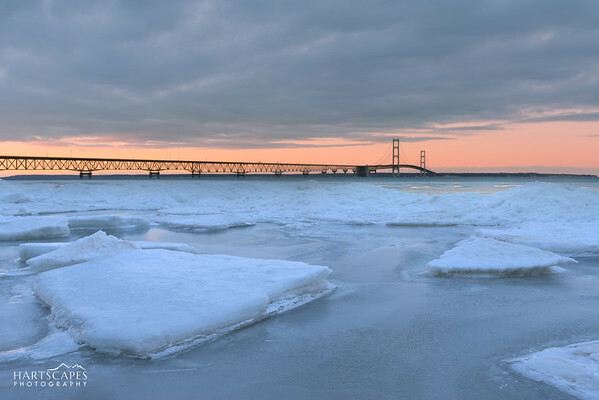 Icebergs frozen in place at the straits of Mackinac during a beautiful sunset on a early March evening.